(2) confusion over the government’s Brexit transition deal strategy – with reports that some senior Tory ministers want it to last for more than two years, while Boris Johnson’s more stringent ‘red lines’ suggest a more complex transition period than just the ‘status quo’ extension. It will be the first channel that is likely to command GBP’s attention in the near-term and our scenario analysis provides some guidance for what to expect. Our short-term financial fair value model estimates show a 1-2% risk premium currently priced into GBP, which suggests that there is a potential for a GBP relief rally if questions over PM May’s leadership credentials abate. • We would expect GBP to recover its latest conference-related losses should May cling on and domestic political risks meaningfully ease. The narrative will shift back to the Bank of England story, with risks of the UK curve steepening further if Carney & Co support a rate hike with a constructive outlook for the UK economy at the November BoE meeting. • Should the Foreign Secretary Boris Johnson leave the Cabinet, markets may see this as drawing a line, albeit temporarily, under the current split within government which many believe is all too apparent. That would be a catalyst for a symbolic relief rally in the pound, taking GBP/USD back to 1.33 (EUR/GBP: 0.88). • While certainly not our base case, a scenario of PM May stepping down – and a Tory Party leadership contest in the near-term – could see the pound getting quickly dumped (with short speculative positions being rebuilt after the recent neutralisation). • First and foremost it would pose major doubts over a November BoE rate hike – which markets are all but pricing in at this stage (75% probability), while it could dampen some of the recent cyclical upside seen in the UK data – especially the forward-looking indicators. • A dovish BoE re-pricing on its own could see GBP/USD tumble below 1.30, while a sustained increase in GBP’s political risk premium could fuel the move lower to 1.26-1.27 (EUR/GBP to 0.93). 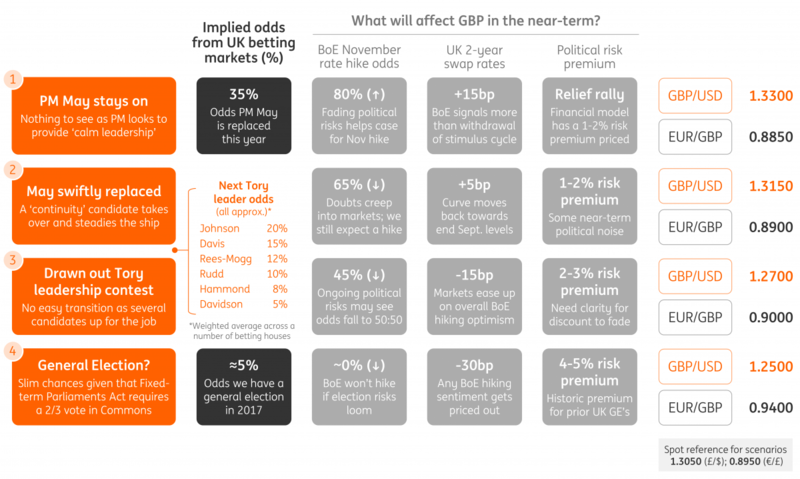 Were PM May to be swiftly replaced – and in particular by a ‘continuity’ candidate (ie, David Davis or Amber Rudd) – then we would expect GBP’s pain via the short-term political risk channel to ease. But the damage may already be done in highlighting the stark divergence of views on key Brexit issues within the Conservative Party and this week has provided a reality check on GBP’s potential to benefit from a Brexit transition deal. We see trivial risks of a General Election being called in 2017 given that the Fixed Term Parliaments Act (and requirement of a two-thirds majority in the House of Commons). But our economists note that there have been 4-5 by-elections each year on average since 2010 and a series of Tory losses could hypothetically stoke up election risks.